I woke up yesterday with a beaming smile, thanks to perfect summer weather and the fiance lying next to me. (He's back home from the road again, with no tour bus in sight for two whole weeks!) As I sat down to work, I was instantly transported back to those final days of the school year. Remember those days? When all you could do was stare out the window at the sunshine and count down the minutes until the bell rang, when you could finally escape to sweet, glorious early summer freedom? I got a little work done, but finally caved to the temptation and decided to play hooky via a little field trip to our favorite vintage shop. This store is insane: 10,000 square feet of antique and thrifty goodness, full of everything from 1920s hat boxes to endless bins of vinyl records to brightly colored Fiestaware. I was a little sad to see my favorite vintage camera vendor's booth replaced with antique guns (boo! ), but still scored some great finds: an old linen table runner, a 1960s yellow flower brooch, an old Swedish tile for my stepmom, and a lovely powder blue 1950s handbag. Today it's back to business as usual, but the sun beaming through my window is awfully hard to resist. Maybe I'll take a 3/4 day today. What about you? Any exciting plans for the day? I am so jealous...I am stuck working today! I want to know what store that is! I need to make a stop! Today I'm at the day job (lame) and then shopping with my best friend in the afternoon. Awww what a fun day! You deserved it miss worker bee! That place looks awesome!!! Wish we had something like that here. Oh wow, that place looks amazing!! I want that adorable deer and I totally need the owl! where is this store? I want to get lost in there. I would probably need to tape my hands down so A) i wouldn't break anything and B) steal it! Great finds! 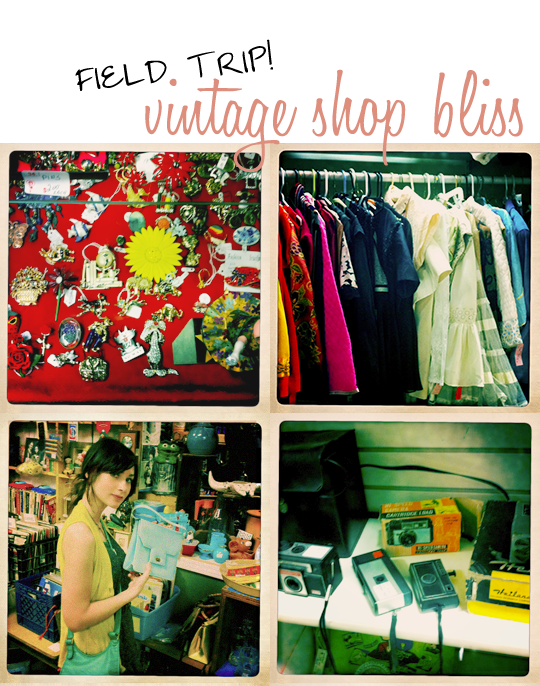 Funny, I was doing vintage shopping saturday with my honey. We don't tend to wander the store together. We have completely different interests. What's the name of your favorite shop...I'll share if you do ;) Though, mine is almost in Wisconsin...boo. Love blue vintage purses. Score! I am just starting to blog and was thinking of a series called...Terrific Tacky Tuesday... where I would catalog the insanely tacky things you find at vintage shops. HMMM...we'll see. That store looks insanely fun. Did you buy that little blue bag? I have a cream one almost exactly like it! i envy you! i wish there was a building full of awesomeness near where i live. it would be like disneyland to me, the happiest place on earth. 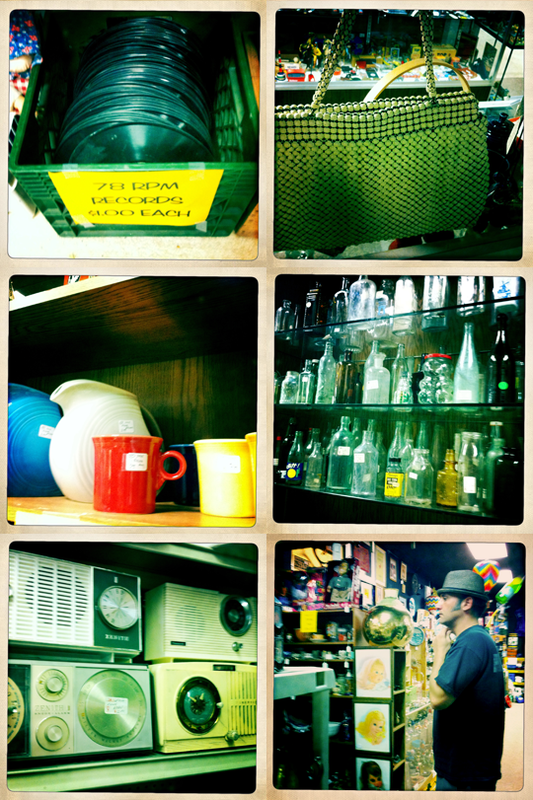 Love the thrift store pics! I really wish there was one I could get too easily without a car. Sadly, there isn't. I might break down at some point and join zipcar. ps. i'm hosting a giveaway over on my blog this month. hope you check it out! Thanks for your comments everyone! :) For those who asked, the name of this amazing vintage shop is called 'Out of the Attic' Antiques, and it's in the Chicago suburbs (Naperville/Aurora border). It's definitely worth checking out if you live in the Chicagoland area! Sounds like a fabulous day! I just have one complaint. You didn't buy the owl! It's so cute I would have had to leave with it! I am DESPERATELY seeking a Fiestaware butter dish and deviled egg platter to go with my collection. If you stumble upone one there PLEASE PLEASE PLEASE let me know! I will reimburse you and any color is fine. Maybe when we are in Chicago for Phish we can take a field trip there? I love the pics... and that last day of school feeling! Enjoy the next two weeks!! How fun! 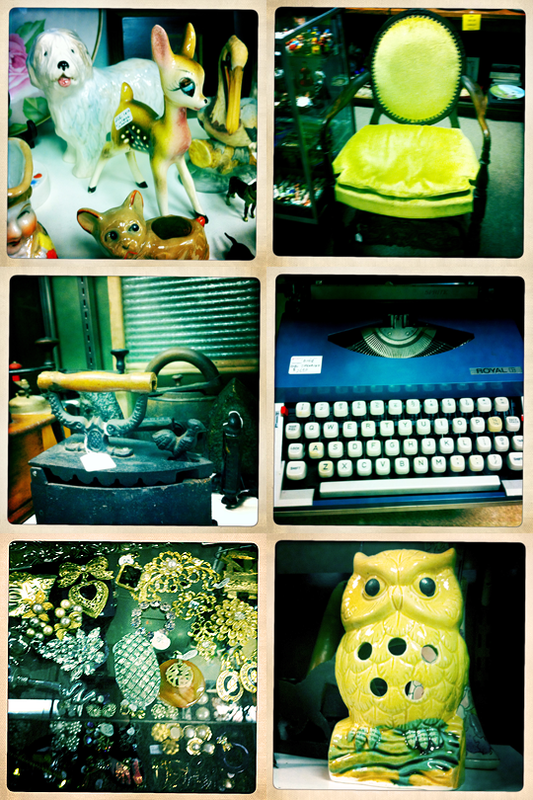 I love wandering vintage stores..that looks like a fab one! I would have to have some of that Fiestware!